Congratulations to the Broomhill Tractor Builders from Coachford Co. Cork who have won the All Ireland Ferguson 20 Tractor Building title for the third time. The competition held at the national Ploughing Championships saw the team of John Joe Dennehy, Greg Cronin, Danny Martin and Bobby Roche beat off strong opposition from Donegal , Galway, Cavan and Sligo teams to win the title for the third time in five years. The lads built the tractor from scratch in a time of 7 minutes and 37 seconds. Team manager, Tadgh Murphy said “ we are absolutely thrilled to win the title again this year. The lads trained hard for this event and have been putting in 3 to 4 hour sessions three nights a week in perfecting the build. It was great building in front of such a huge crowd and the cork contingent here at the ploughing really got behind us.” The team will be presented with their trophies at a function in Coachford in the coming weeks. A meeting will take place in the Community House Coachford on Friday October 11th at 8.00pm to explore the possibility of starting a new youth club in the area. Representatives from Foróige will be present to outline what the steps are to start one of their clubs in the village. Those who would like to help out as Leaders and those who want to find out more about Foróige are very welcome to attend. Well done to the Under 13 footballers who were victorious in the East Region League Final when they defeated Passage on a score line of 4-10 to 1.07. The Aghabullogue Boys played some lovely football to earn the victory and were well on top throughout the game. Aghabullogue GAA are hosting their annual tribute to one of the legends of the club this weekend. The John McSweeney memorial tournament kicks off at 4pm this Saturday in Coachford. It will see the young men from Coachford, Aghabullogue and Rylane coming together to celebrate John’s life, his wonderful sense of humour, his friendship and his pure skill as a hurler and footballer. Rylane won the tournament last year but the boys from Coachford and Aghabullogue are anxious to get revenge on Saturday. Come to the pitch for the craic and to remember the great John McSweeney. The Coachford premier team defeated Knocknaheeney Celtic in the first round of the AOH cup last weekend by 3 goals to 2. The city side went two goals up after 25 minutes and Coachford had to dig deep to get back level. New signing for this season, Lazar Radulesku grabbed the winner for the Mid Cork side on 67 minutes. The 2nd round of the cup takes place this Saturday when the boys take on Corkbeg in Whitegate at 3.00pm. In the same competition on Sunday the Coachford second team play Dunbar Celtic at 10.45am. Victories for the under 12s and under 14s ensured that the Killanardrish/Coachford Schoolboys teams had a very productive weekend in the National Cup competitions. The under 12s defeated neighbours Strand United by 3 -1 while the under 14s were emphatic winners in a very one sided game against Tramore Athletic’s second team. This weekend the Carrigadrohid pitch is due to witness three games on Saturday. First up is the Under 16s who play Buttevant in the Division 2 of the league at 10.30am. At 12.15pm the under 12s play Glounthaune in the league and once they leave the pitch the Under 13s take to it to play their first round of the National Cup against the formidable Crosshaven side at 1.30pm. 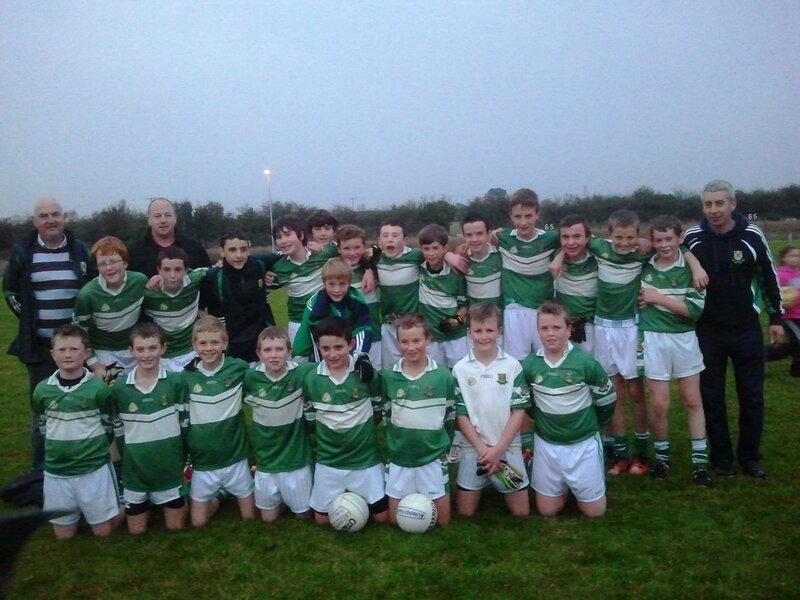 On Sunday the under 14s will entertain Leeside in the league at 10.30am in Carrigadrohid. There was no winner of the Coachford AFC Lotto this week. The numbers drawn were 22, 24 and 32. The Lucky dip winners were Connie O Sullivan (€40), Paul Maher, Finbarr O Sullivan, Sophie O Shea and Marian O Connell (€20 each). Next week’s jackpot is now a massive €3,200 so get your tickets early. Next week’s draw takes place in Hogans bar on Monday night. The Coachford area St. Vincent de Paul branch will be holding a Card Drivein October to raise much needed funds to help us in assisting local families this Winter. They would be grateful if anyone has any unwanted gifts to donate or any sponsorship for spot prizes for this event. Please contact the SVP mobile on 087 1728280. Any contributions, as always, are very much appreciated. Aghabullogue camogie club are holding a fundraising coffee morning/cake sale on Sunday the 6th of October at 10.45am in Coachford. This will be run in conjunction with an underage camogie blitz which will be going on in the pitches at the same time. Come along have a cuppa and view the up coming stars of the future. This entry was posted in Useful Numbers and tagged Aghabullogue GAA, All Ireland tractor building, Broomhill Vintage Club, Cake sale, Foróige. Bookmark the permalink.